Dr. Domzalski has been trained in all the latest techniques to get you the help you need for all your issues. Our up-to-date, full-service facility can do everything you need in office. From x-rays to electric stimulation, never go to another location for the services you need. All our services are outpatient and get you back to your life the very same day! Don't miss out on living because of pain; learn more about what Dr. Domzalski can do for you today! Get an end to your pain at Domzalski Chiropractic. Since 1984, Dr. Domzalski has been finding relief for a variety of chronic pains and discomfort. With a full-service facility, you can get everything from on-site x-rays to electric muscle stimulation. Work with us to discover all the necessary ways to overcome your pain and improve the quality of your life! At last I found a great chiropractor! You got my back in shape in the fastest amount of time than anyone else i have ever gone to. I thank you, thank you, Thank you! I have been a patient of Dr. Domzalski for over 15 years. During this time, his treatments have been of great help to me in maintaining a lower back free of pain. As an avid golfer I am able to play without any discomfort. This is a big plus for me. When I arrive for my appointment, i am warmly greeted by his receptionist. I have never had to wait for more than a few minutes for treatment. I would highly recomment his services to anyone requiring chiropractic treatment. Appointments are always on time - no waiting. Good listener and attentive to the problem. Had a positive impact on my back pain. Dr. Domzalski has successfully treated my chronic back condition on more than one occasion. His treatments have allowed me to avoid back surgery. I find Dr. Jim to be knowledgeable, highly professional, friendly, and very competent. He listens and explains the treatment. The office is friendly. Appointments are easy to schedule and are on time. I have been to various chiropractors in the Venice area. No one has given me the immediate relief that Dr. Domzalski has. Over ten years ago I came to see Dr. D. for the first time. My neurologist had about given up on helping me with my back pain. He wanted me to see a surgeon. I could not stand up straight and lived on muscle relaxers. After three weeks of treatments with Dr. D. I was off the pills and in nine weeks I was standing up straight. I have been a patient ever since and I highly recommend him to anyone. We have our office on a great location to serve Venice and surrounding areas. 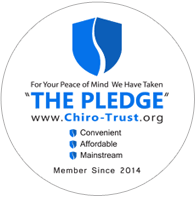 Meaning great chiropractic care is only a few minutes from your home.